Open Heart Studio is a place to practice opening your heart to compassion and creativity. Are you ready to open to more joy, more freedom, more compassion, more creativity in your life? Are you looking for support to step onto a creative path? Join me for an Open Heart Studio session. 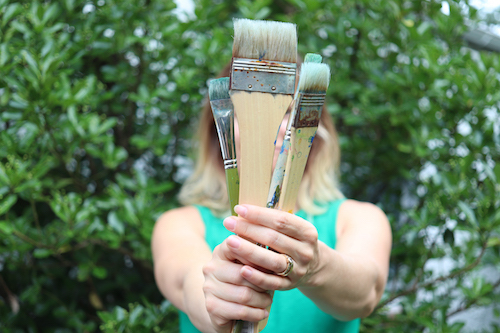 At this session you will get to work on your very own canvas to take home with you and you'll participate in an Open Heart workshop: exploring strategies and inspiration to open your heart. Beginners welcome. People afraid of painting and the canvas welcome. This is about willingness and curiosity and courage...not experience, not skill. This is a sacred space to be vulnerable and open at the canvas, to be gentle with your heart, to find stillness in a busy week/life, to find the freedom you long for. I believe that each of us can make an imperfect offering at the canvas. And what is profound is how something in your heart shifts while creating this offering. We don't have to be good enough. We just have to show up. Attending an OpenHeart Studio session is holding space in your day/week/month to take care of you, to restore, to be gentle, to be curious. Note: Open Heart Studio is NOT a traditional art workshop. You will learn some basic strategies/techniques but it is more about the heart than the art. Check out Abington Art Center, Cheltenham Adult Education or other classes for foundational painting courses for more technical support and skill development. ”Everything you need is there, you just show up. I felt tired of adulting and this felt like a time away from my responsibilities. A time to just be. ”I wasn’t sure going into it how it would feel, but I was such a relaxing and powerful experience. I went from self doubt to I can do this. There has been a lasting impact in my life. Since completing the workshop, I have been thinking about the mantras we discussed during the studio time and how I felt while painting, and trying to apply that freedom and lack of judgement to other aspects of my life. ”It is a great way to touch base with yourself and your values with no pressure, and that doing it with others who are looking for the same space makes the experience that much more powerful. All materials (paints, brushes, aprons, easels, etc.) will be provided. All you need to bring is an open heart and a few ideas of inspiration of what you might like to paint. No experience necessary. Beginner’s welcome. Can't make the session listed? I hope to make offering 1x a month at different days/times. Sign up for my studio newsletter to be notified of new offerings.